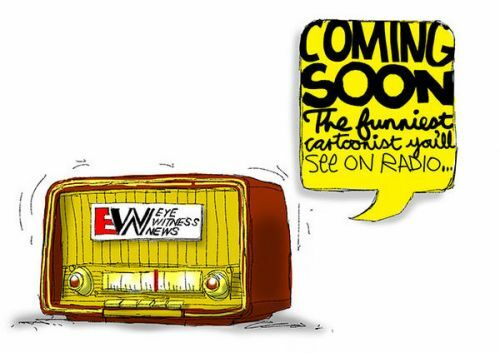 JERM, the political cartoonist who was famously fired last month from his government aligned newspaper "for being too political", has bounced back, landing himself a position as editorial cartoonist for Eyewitness News (EWN). His cartoons will appear twice weekly on the news service's website, making it the first news site in South Africa to feature original content by an editorial cartoonist, and breaking new ground for JERM, a pioneer of digital cartooning in South Africa. The deal will also bring editorial cartoons into the radio space, providing EWN's radio partners such as 702 and Cape Talk a rallying point around which issues of the day could be discussed. EWN editor-in-chief, Katy Katopodis is excited to bring Jerm on board, saying “it’s an important chapter in South Africa’s cartoon history and a giant, bold leap for EWN”, which she says strives to bring users the news in several different ways, including pictures, videos, special features and now witty, incisive cartoons. “We’ve grown from a strong radio-only news brand into one which is making waves on several digital platforms as well." Jerm, who goes by the name of Jeremy Nell when he's not being a cartoonist, is no stranger to new territory. In 2007 he became The Times' first editorial cartoonist, drawing the new newspaper's daily front page 'pocket cartoon' for almost 3 years. 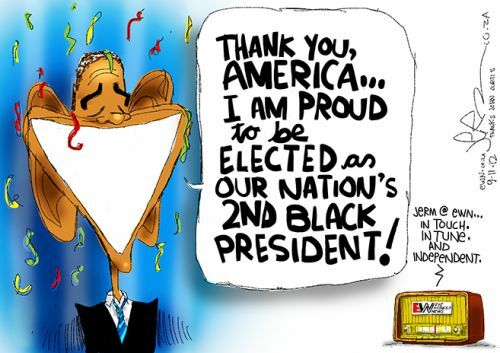 He then moved to another new newspaper, The New Age, as their inaugural cartoonist where he worked until his firing three weeks ago. In his inaugural cartoon, Jerm strongly aligns himself with Eyewitness News' philosophy which declares it to be "In Touch. In Tune. And Independent". Jerm’s first cartoon appears on Friday 9th November and will be followed by regular cartoons every Wednesday and Friday. EYEWITNESS NEWS introduces their new cartoonist in this video. [2 mins]. 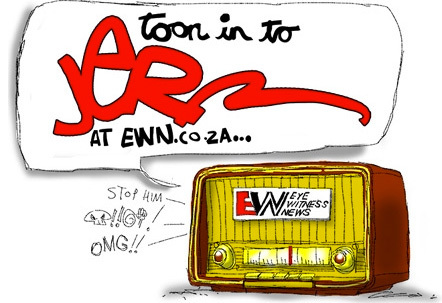 BIZCOMMUNITY: Jerm brings cartoons to radio via EWN website. 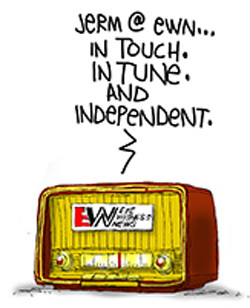 EYEWITNESS NEWS editor-in-chief Katy Katopodis tweeted a link to the above teaser yesterday, hinting at a new cartoonist's position for the radio news service, which provides news to several SA radio stations including Cape Talk and 702. The link featured a teaser cartoon (also posted on their website) which showed a radio with the words "Coming Soon, the funniest cartoonist you'll see on radio". Wait a minute... a radio cartoonist?!! "All will be revealed on Friday", says Katopodis. Meanwhile, africartoons fans might recognise the imitable style and wit of the teaser cartoon's author. This website is sworn to secrecy. But we can say that Africartoons.com welcomes the creation of a new spot for South Africa's burgeoning pool of cartooning talent, and particularly one which appears to be breaking new ground for cartoonists and lovers of editorial cartoons.